Phytocultures’ is based in Clyde River, Prince Edward Island. Our site includes a 3000 square foot plant tissue culture laboratory, multiple large-capacity greenhouses for the propagation of plants, and a variety of fruit and berry test plots on our 28-acre site. 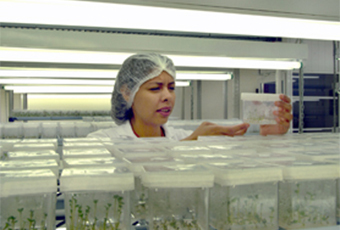 Our genetic resources have been collected from national and international plant repositories, genetic resource banks, private plant breeders, and from selections of superior clones of some wild grown plant species. 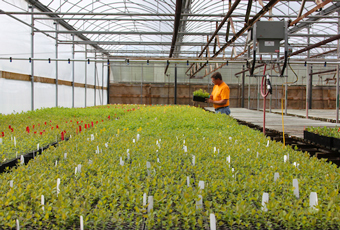 Production exceeds 150,000 plants annually. Propagating plants through tissue culture. 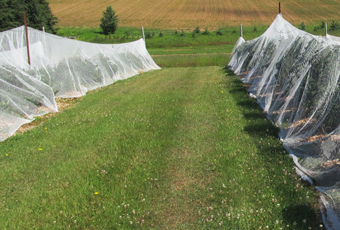 Bird netting protecting Haskap trial plot. Our office and facilities are located at 43 MacNevin Drive, Clyde River, Prince Edward Island. We invite you to visit our facilities to see our research plots for yourself and plant propagation activities for yourself. Contact us to arrange a meeting, and come taste tomorrow’s flavours today!